Akaka attended public schools in Honolulu and graduated from the Kamehameha School for Boys in 1942. After high school, he followed in his father’s footsteps and began working as a civilian welder and mechanic for the Hawaiian Electric Company. He joined the U.S. Army Corps of Engineers upon being drafted in 1945 and received an honorable discharge from the Army in 1947. He then served as the first mate on the schooner Morning Star out of Hawaii for a year. In 1948 Akaka married Mary Mildred Chong, with whom he had five children, Alan, Millannie, Daniel Jr., Nicholas, and Gerard. After his year at sea, Akaka attended the University of Hawaii, where he received a bachelor’s degree in education in 1952, using benefits from the GI Bill to pay his way. Akaka earned his professional certificate in secondary education and began teaching in 1953 at Kahuku High School. He then moved on to Pearl Harbor Intermediate School and ended his teaching career in elementary schools in suburban Oahu in 1960. After acquiring his professional school administrator’s certificate, Akaka transitioned into school administration. He had also worked for the Hawaii department of education as an education program specialist beginning in 1953, a position he held for 18 years.4 While working as a principal in the Oahu school system, Akaka completed a master’s degree in education from the University of Hawaii in 1966. Three years later Akaka became chief program planner for compensatory education for the Hawaii department of education. From 1971 to 1974, he served as director of the Hawaii office of economic opportunity. Akaka’s ascension through the ranks of the Hawaii education department caught the attention of longtime Democratic godfather Governor John Burns.5 Constantly on the lookout for fresh talent, Burns regularly invited Akaka to the governor’s mansion to eat breakfast and discuss the need for a Native-Hawaiian presence in politics. “I had never thought about it before then,” Akaka admitted.6 Incapacitated by cancer late in his third term, Burns urged Akaka to transition from administration to politics. In 1974 Akaka ran in the Democratic primary to be George R. Ariyoshi’s running mate for governor. Ariyoshi specifically wanted Akaka on the ticket for lieutenant governor as a Native Hawaiian. Akaka entered Congress with the hope of securing a seat on the Appropriations Committee, but was told not to expect much, coming from a small state. He recognized the difficulty of his position. “You cannot get into the committee unless somebody dies, or somebody resigns or leaves the House.” When a seat did open up during his second term, Akaka aggressively pursued it and reminded Speaker Tip O’Neill of Massachusetts of his unwavering loyalty. “I think that made a difference,” Akaka recalled, “because the next day, Charlie Rangel [of New York] called me and said, ‘Danny, you’re in.’”14 From the Appropriations Committee and its Agriculture Subcommittee, Akaka supported the causes of the sugar and pineapple industry, tourism, and environmental protection, issues that loomed large for his constituency. He also continued his advocacy for Native Hawaiians. Akaka focused on that behind-the-scenes approach to legislating particularly through his seat on the House Appropriations Committee, where he coordinated with fellow Hawaiian Daniel Inouye on the Senate Appropriations Committee. Saiki, with support from the national party, led Akaka in the polls as late as October. While the campaign between the two former teachers remained largely polite and, therefore, true to Hawaiian “Aloha” values, Akaka hit hard on his early Senate service, particularly his work for the sugar industry as well as his party bona fides, in an overwhelmingly Democratic state. “If it were not for the Democrats and the Democratic majority in Congress, Hawaii would suffer,” Akaka claimed.17 In his tightest race since 1976, Akaka won with 54 percent of the vote, surpassing media expectations.18 Surprisingly, he drew large Japanese-American support despite Representative Saiki’s prominent position within that influential Hawaiian community. Akaka was initially appointed to three committees in the 101st Congress (1989–1991): Energy and Natural Resources; Veterans’ Affairs; and Governmental Affairs.21 He served on the latter two committees throughout his tenure in the Senate. His reputation as an ally of federal employees grew out of his position on the Governmental Affairs Committee, renamed the Committee on Homeland Security and Governmental Affairs in 2005 in response to the executive reorganization in the wake of the September 11, 2001, attacks. He chaired the Federal Workforce Subcommittee and regularly reached across the aisle on behalf of federal employees alongside Senators George Voinovich of Ohio and Susan Collins of Maine, both Republicans. Akaka often referred to Voinovich as a “brother,” and he engineered whistleblower protection legislation with Senator Collins. Akaka served on the Banking, Housing, and Urban Affairs Committee during the 107th Congress (2001–2003) and again during his final term from 2007 through 2013. Akaka helped to develop the Dodd–Frank Wall Street Reform and Consumer Protection Act in 2010, authoring the section of the bill establishing the Office of Financial Education in the Consumer Financial Protection Bureau and creating grant programs for consumer education. Akaka attempted to offer alternatives to predatory financial products like high-interest payday loans. Long an advocate of financial literacy and education, Akaka also sponsored the Excellence in Economic Education Act (S. 1487) in the 106th Congress (1999–2001), which provided federal funding for teacher training and school activities for economic education. Much of his bill passed as part of the No Child Left Behind Act in 2002. Senator John Ensign of Nevada feared that the bill would lead to legal gambling on Native-Hawaiian land and repeatedly placed holds on it. In response, Akaka led the Hawaiian delegation in inserting a provision into the bill that prevented any new Native-Hawaiian government from authorizing gambling.37 Akaka gathered support from an overwhelming majority of Democrats and several Republicans, including allies in Alaska and Republican Governor Linda Lingle of Hawaii. However, President George W. Bush promised to veto the bill. As a result, it languished in Senate committees. After the bill stagnated under anonymous holds in the Senate for much of the 111th Congress (2009–2011), the Department of Justice requested revisions in 2010. Governor Lingle rejected those revisions and withdrew her support from the bill, which shrank Republican support in the Senate.39 Unable to overcome Republican opposition, Akaka’s efforts sputtered at the close of the 111th Congress. He reintroduced the bill in the 112th Congress (2011–2013), but had no real expectations of passage. Akaka’s quiet, but constant, service in the Senate guaranteed him wide margins in his first two re-election campaigns; he carried more than 70 percent of the vote in both 1994 and 2000.42 In 2006, however, he faced his only real electoral test since his 1990 special election. Voicing concerns about the age of Hawaii’s two Senators, who were both more than 80 years old at the time, Representative Ed Case challenged Senator Akaka in the Democratic primary. “We have to think how we will move on, we want to have control how we move forward,” Case said in his announcement, setting himself up as the vanguard of Hawaii’s next generation of leaders. He also claimed a more moderate voting record than Akaka. The rest of Hawaii’s Democrats were unprepared for the announcement, and Inouye immediately requested that Case withdraw.43 Both the Hawaii and national Democratic establishment shut Case out, but he attracted the support of national business leaders. Despite raising roughly three times more in campaign donations than Case, Akaka felt threatened, as polls showed a surprisingly tight race. He spent the entire month leading up to the primary campaigning in Hawaii and focusing on Case’s assertion that he would have voted for the 2002 authorization of force against Iraq, which Akaka had voted against.44 Akaka survived the primary, garnering 55 percent of the vote. Republicans expected Akaka to be weakened heading into the general election, but Akaka handily defeated opponent Cynthia Thielen in November with 61 percent of the vote. After the intense primary in 2006, Akaka decided not to run for re-election in 2012. He retired from Congress at the age of 88 and resided in Pauoa Valley in Honolulu, Hawaii until his death on April 6, 2018. 1Helen Zia and Susan B. Gall, eds., Asian American Biography, vol. 1 (New York: UXL, 2003): 1; Politics in America, 1992 (Washington, DC: Congressional Quarterly Press, 1991): 391. 2Rosemarie Bernardo, “Lawmaker Courts Supporters With a Gentle, Personal Touch,” 18 September 2006, Honolulu Star-Bulletin, http://archives.starbulletin.com/2006/09/18/news/story01.html (accessed 26 August 2015). 3Congressional Record, Senate, 105th Cong., 1st sess. (21 October 1997): S10867–S10869. 4Don T. Nakanishi and Ellen D. Wu, eds., “Daniel K. Akaka,” in Distinguished Asian American Political and Governmental Leaders, (Westport, CT: Greenwood Press, 2002): 5–8. 6Pete Pichaske, “Akaka Eager to Serve 5th Term,” 11 October 1999, Honolulu Star-Bulletin, http://archives.starbulletin.com/1999/10/11/news/story4.html (accessed 4 March 2016). 7Lynda Arakawa, “Ethnicity a Factor in Election,” 7 April 2002, Honolulu Advertiser, http://the.honoluluadvertiser.com/article/2002/Apr/07/ln/ln11a.html (accessed 14 September 2015). 8Tom Coffman, The Island Edge of America: A Political History of Hawai‘i (Honolulu: University of Hawai‘i Press, 2003): 296–298. 10Politics in America, 1992: 391. 11As quoted in Maralee Schwartz, “Rep. Akaka Named to Fill Senate Seat From Hawaii,” 29 April 1990, Washington Post: A4. 12For a full listing of Akaka’s committee assignments in the House of Representatives, see Garrison Nelson, Committees in the U.S. Congress, 1947–1992, vol. 2 (Washington, DC: CQ Press, 1994): 10–11. 15Politics in America, 1992: 391. 16Karen Foerstel, “Sen. Akaka Sworn In To Serve Six Months,” 17 May 1990, Roll Call: 14. 17Michel McQueen, “Akaka and Saiki Fight for Hawaii Senate Seat with Some Hula Hoopla but Little Mudslinging,” 1 October 1990, Wall Street Journal: A16. 19“House, Senate Vote Against Cut in Sugar Support Price,” 25 July 1990, San Antonio Express-News: E2. 20Zia and Gall, eds., Asian American Biography: 2–3; Politics in America, 1992: 391. 21For a full listing of Akaka’s committee assignments in the Senate, see Garrison Nelson, Committees in the U.S. Congress, 1947–1992, vol. 2: 10–11; Garrison Nelson and Charles Stewart III, Committees in the U.S. Congress, 1993–2010 (Washington, DC: CQ Press, 2011): 560–561. 22Joe Davidson, “Feds Lose a Friend as Akaka Leaves Senate,” 29 November 2012, Washington Post, https://www.washingtonpost. com/local/feds-lose-a-friend-as-akaka-leaves-senate/2012/11/29/e85e5ada-3a5b-11e2-8a97-363b0f9a0ab3_story.html (accessed 5 December 2012). 23Politics in America, 2010 (Washington, DC: CQ-Roll Call, 2009): 305–306; Congressional Record, Senate, 112th Cong., 2nd sess. 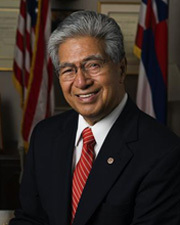 (28 December 2012): S8498–8499; Joint Committee on Printing, Daniel Akaka: U.S. Senator from Hawaii Tributes in the Congress of the United States, 113th Cong., 2nd sess., S. Doc. 3 (2014): vii. 24Politics in America, 2010: 305–306; “Akaka to Renew Fight for Filvets,” 17 October 2008, Filipino Reporter: 1, 12, 28. 26“FEMA to Keep Honolulu Office,” 15 June 2005, Pacific Business News, http://www.bizjournals.com/pacific/stories/2005/06/13/daily23.html (accessed 18 January 2016). 27Politics in America, 2010: 305–306; Joint Committee on Printing, Daniel Akaka: U.S. Senator from Hawaii Tributes in the Congress of the United States. 28Albert Eisele, “Sen. Akaka’s Defense of Asian-Americans,” 26 March 1997, The Hill: n.p. 29Congressional Record, Senate, 103rd Cong., 1st sess. (27 October 1993): 26423–26429. 30Politics in America, 2010: 305–306; Senate Committee on Indian Affairs, “Senator Daniel K. Akaka Introduces Bill To Protect Native Women Against Domestic Violence And Sexual Assault,” press release, 31 October 2011, http://indianlaw.org/safewomen/save-native-women-act-introduced (accessed 29 September 2015). 31“The Hawaii Decision,” 25 February 2000, Washington Post: A22. 32Scott Charton, “Native Hawaiians Push for Status as Indigenous People,” 25 August 2000, Northwest Asian Weekly: 1. 33Congressional Record, House, 110th Cong., 1st sess. (17 January 2007): E135. 34“The Akaka State?,” 2 June 2006, Wall Street Journal: A18. 35“Aloha, Segregation,” 17 December 2009, Wall Street Journal: A26. 36Hearings before the Senate Committee on Indian Affairs, Native Hawaiian Government Reorganization Act, 111th Cong., 1st sess. (2009): 3–4. 37Derrick DePledge, “GOP Senators Quietly Muscle in Against Akaka Bill,” 21 July 2005, Honolulu Advertiser, http://the.honoluluadvertiser.com/article/2005/Jul/21/ln/507210342.html (accessed 20 January 2016); John Yaukey, “2007 Akaka Bill Gets Reintroduced,” 8 May 2009, Honolulu Advertiser: B2. 38B. J. Reyes, “Obama Would Sign Akaka Bill as President,” 22 January 2008, Honolulu Star-Bulletin, http://archives.starbulletin.com/2008/01/22/news/story05.html (accessed 23 September 2015); Dennis Camire, “Odds for Akaka Bill’s Passage Better Than Ever,” 8 December 2008, Honolulu Advertiser: A1. 39Richard Borreca, “There’s Still Some Life Left in Akaka Bill,” 21 November 2010, Honolulu Star-Advertiser: n.p. 40Daniel Akaka, “Hawaii Delegation Agrees on Final Text of Native Hawaiian Government Reorganization Act,” press release, 22 February 2010, https://votesmart.org/public-statement/485944/hawaii-delegation-agrees-on-final-text-of-native-hawaiian-government-reorganization-act#.WHj4lVMrKUk (accessed 23 September 2015). 41Daniel Akaka, “Akaka Calls for Passage of Native Hawaiian Government Reorganization Act in Honor of Senator Inouye,” press release, Senate Committee on Indian Affairs, 21 December 2012, http://www.indian.senate.gov/news/press-release/akaka-calls-passage-native-hawaiian-government-reorganization-act-honor-senator (accessed 25 August 2015). 43Richard Borreca, “Case to Oppose Akaka,” 20 January 2006, Honolulu Star-Bulletin, http://archives.starbulletin.com/2006/01/20/news/story01.html (accessed 20 January 2016). 44Nicole Duran, “Where Would You Rather Be?,” 13 September 2006, Roll Call: 11. Akaka, Dan, with Jim Borg. One Voice: My Life, Times and Hopes for Hawai’i. Honolulu, HI: Watermark Publishing, 2018. "Daniel K. Akaka" in Asian and Pacific Islander Americans in Congress, 1900-2017. Prepared under the direction of the Committee on House Administration by the Office of the Historian and the Office of the Clerk, U.S. House of Representatives. Washington: Government Publishing Office, 2018. U.S. Congress. Tributes Delivered in Congress: Daniel K. Akaka, United States Congressman, 1977-1990, United States Senator, 1990-2013. Washington: U.S. Government Printing Office, 2014.